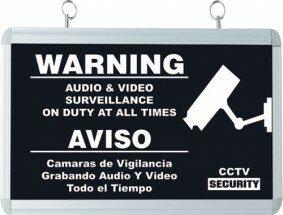 This is a powered warning sign that comes with a 12V DC power adaptor that needs to be plugged in to electricity. Of course, you don't have to plug this to electricity if you don't want to. The sign is about 10x17 inches, and is double sided, meaning you can hang this sign and there is a warning sticker on each side. Great for hanging in a entry way.